Zombie you control get +1/+1. 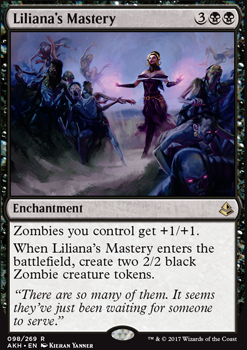 When Liliana's Mastery enters the battlefield, create two 2/2 black Zombie tokens. I will preface this by saying black and zombies are my favorite color and tribe respectively but I have not played very much modern. Vampire Sovereign is not a zombie, and the deck has enough endurance and recursion to not really need flyers or direct damage, and the sovereign is a bit expensive. Cryptbreaker results in more zombies and more cards in the graveyard, which is also more zombies, and will refill your hand if the game goes late or you are playing defensively. 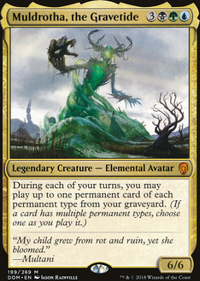 Alternatively, if you do want the lifesteal instead of being more focused on aggro, raydenkiller's suggestion of Gray Merchant of Asphodel (Gary for short) is good for the reasons he stated. Foul-Tongue Shriek is cheaper than Sovereign's Bite and will often be better for closing out a game. The big downside is it is more restrictive in that it can only be cast effectively when you are attacking with multiple creatures. Playing only Go for the Throat is risky if you end up playing against an artifact deck, so it could be wise to hedge into the other similar cards like Cast Down and Doom Blade . A great place for these kinds of cards is the sideboard, running 2x of Go for the Throat and Doom Blade in the both the mainboard and sideboard is an easy distribution which would be hard to go wrong with. I don't know much about burn or how to fight it but in my experience control is beaten through hand attack and playing more aggressively. In deckbuilding you'd want to include cards like Duress in the sideboard (or Thoughtseize if you're made of money) and to make your mana curve lower. 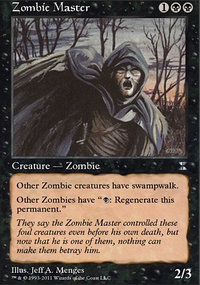 Zombies should have a better match against control than a lot of aggro/midrange decks because the creatures recurring from the graveyard makes their counters much worse. Liliana, Untouched By Death is not the best option for a zombies deck. It isn't necessarily bad, it just isn't very impactful for its mana cost. A more focused effect like a creature or Liliana's Mastery is probably better. 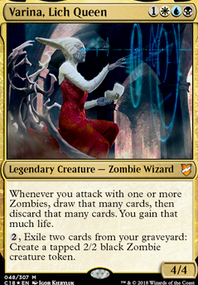 I'd recommend doing some research into zombie decks in modern, seeing what cards they play and seeing if and how they fit into your deck. I hope you do well with zombies! In my opinion you can swap two swamps out for mana rocks, maybe a Charcoal Diamond and a Everflowing Chalice. I personally feel that Door of Destinies is terrible unless you're playing tribal with a low curve and a lot of creature spells (like elves). As an alternative you may want to consider Liliana's Mastery instead. Replace Thoughtseize with Duress if money is a concern. Hey Nick123. I hate to tell you this, but you have this mislabeled. This would be legal in modern, but there are several cards (Cryptbreaker, Diregraf Colossus, Gravecrawler, Gray Merchant of Asphodel, Plague Belcher, Relentless Dead, Unbreathing Horde and Liliana's Mastery) that are illegal in standard. I do not know if you are wanting to play standard, or if this is just casual, but if you are looking to play standard, you will have to make quite a few changes. Either way have fun!